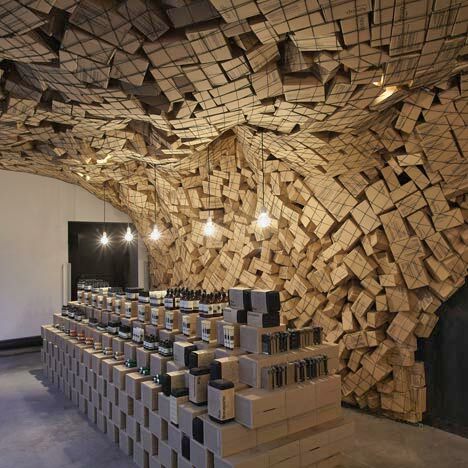 Melbourne practice March Studio have trapped 4500 cardboard boxes behind netting in this store for Australian skincare brand Aesop. Located within Parisian concept store Merci, the installation uses the brand's own packaging in an undulating installation that rises up one wall and spreads across the ceiling. See also: Aesop store in Singapore by March Studio. Photographs are by Louise Baquiast. merci is housing the Australian cosmetics brand Aesop for a spectacular installation in the Orangerie from 18th of December. For merci, Aesop founder Dennis Paphitis challenged Australian architect Rodney Eggleston to imagine an original installation for the space. The project is emblematic of Eggleston's play on repetition and the elevation of everyday objects from commonplace to statement. Rodney Eggleston, founder of March Studio, is an Australian architect of 29 years who lives and works in Melbourne. He began his career with Rem Koolhas and has worked in partnership with Aesop for 7 of the brand's signature stores, most recently Aesop Saint-Honoré, which opened in September at 256, rue Saint-Honoré, Paris. The installation consists of 4500 cardboard shippers and 40m2 of netting.